A token amount of plot: Dwayne Johnson plays 'Driver', a man who has spent the last ten years in prison over a botched bank heist that resulted in the murder of his own brother. Despite a token lecture from 'Warden' (Tom Berenger), Driver immediately embarks on a spree of vengeance, targeting those personally responsible for his brother's demise. His killing spree has caught the attention of two others. 'Cop' (Billy Bob Thornton) is just weeks away from retirement and wants to just make it to retirement without any ugly parts of his drug-addled past coming to light. Finally, one of the men likely on Driver's list has put out a contract on the relentless hunter, and 'Killer' (Oliver Jackson-Cohen) ends up with the job. But as the bodies and complications pile up, all three men must decide what they are willing to sacrifice in order to do what they believe they must as a matter of duty. 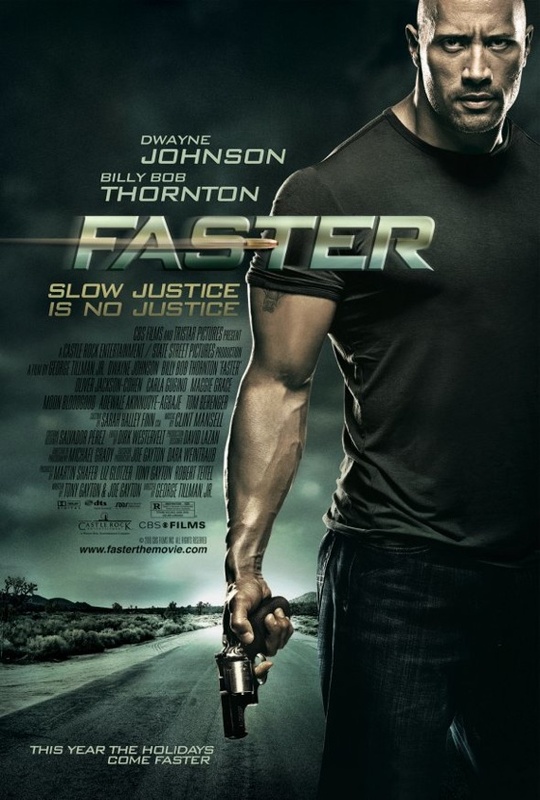 What separates Faster from the more conventional vigilante picture is the emphasis on those around our three main characters. For the first two thirds of the picture, Dwayne Johnson is less a fleshed-out character than a force of nature. He comes, he kills, he leaves. What is interesting is the screen-time allotted to his would-be victims, as some of them seem less worthy of being murdered than others. The supporting cast is filled out nicely by a number of notable veterans, including the aforementioned Tom Berenger, Zander Berkley, Mike Epps, Maggie Grace, and Adewale Akinnuoye-Agbaje. If it needs to be stated, Billy Bob Thornton once again shines at taking what could have been a stock character and making him into a genuine human being. Oliver Jackson-Cohen has less to do, but he provides a genuine humor to the proceedings, while never forgetting to take his character and his situation seriously. The picture basically takes three classic archetypes (the seemingly righteous avenger, the hard-bitten and seen-it-all cop, and the reluctant hit-man who wants to quit) and sends them on a collision course with each other, and peeling back the layers to expose all three men as more than they appear. Helping matters is a certain contemplative tone that allows the picture its moments of quiet amidst the bursts of violence. This really isn't an action picture per-se, as there are only a couple pure action sequences (two car chases - one in a flashback) and a handful of brief violent confrontations to enliven what is basically a mediation on duty and obligation. Yes, Thornton's cop has to choose between his family and his job, but even that choice is not as simple as it might seem (it helps that his wife has just as many issues as he does). And yes Thornton is teamed with a more on-the-ball female detective (Carla Gugino), but she is a full-fledged supporting character, and said female cop (for once) isn't wounded right before the finale so she can sit out the climax. There is a certain humanity to all of the characters in George Tillman Jr's crime story, and it elevates the material past its pulpy surface-level thrills. 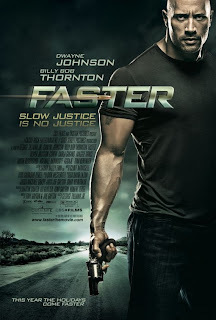 In the end, Faster is a B-movie that earns its stripes by making an effort to be a real film. It's strongly acted across the board, as Thornton once again dominates the proceedings and Johnson again proves how much he can communicate with only his face. I wouldn't call it exciting or even particularly fun, but it's a thornier, more intelligent picture that the sort of action picture that usually gets dumped on Thanksgiving weekend. Compared to the likes of Hitman and Ninja Assassin, it's a genuine work of art. Very good review! You made me honestly interested in seeing this film.